Over the past few years, I have had some experience with using Ezoic as the main source of income for one of my websites: AskWillOnline.com. It looked a very promising program to use that claimed to significantly improve the revenue your website produces from advertising. However, I did not have the best of experience with Ezoic which was mainly due to Ezoic changing my already-optimised theme to something that just did not look at all good. As well as this, what price was there for having more adverts, that were generally larger, to the user experience of people visiting the site? Since then, AskWillOnline.com had stopped using Ezoic and went back to the tried-and-tested Google Adsense. However, for a new website of mine, FreePoemAnalysis.com, I gave Ezoic a second chance since I hear that Ezoic can still increase reveneue when used right. Maybe I was not using Ezoic right? For this reason, here is my experience with using Ezoic for the last few months, with images and data to quantifiable tell you just exactly what impact it had to my website, FreePoemAnalysis.com. I know many website owners don’t like to do this. However, sometimes, transperancy is the best thing to do to give the clearest review. FreePoemAnalysis.com is a website I created back in December 2015 to be a content-mill for analysing poetry. It is in a niche on the internet which is made clear from the traffic increase it has been getting, which is almost going at an exponential rate. It is actually even shocked me how successful it has become which takes some doing! Although it is not included in the above screenshot from Google Analytics, I can at least tell you that figures are well into their 6 figures for traffic, so it is by no means a slouch. On the whole, the responsiveness made the adverts looked good and provided, as made clear, a solid RPM for it. Early December 2016, I decided to give Ezoic a second chance by incorporating the program onto Free Poem Analysis. For those that do not know, Ezoic works as a certified Adsense partner to test the many different possible ad sizes, locations, number of adverts, type of adverts and much more to determine the best set up for certain traffic to make you the most amount of money. It is always iteratively learning too, to always constantly find what is performing the best for your website. At first, I linked Ezoic to my nameservers, which was the perferably option my Ezoic buddy Gavin told me to do. Gavin is an Ezoic employee I am still in contact with today who helped me set up my website with Ezoic and provided a lot of help (I hope other revenue generating programs are listening) – having a port of contact makes a huge difference. This was actually one of the things that attracted me to Ezoic second time round. Ezoic enables you to have more than 3 adverts on any one page unlike the standard Adsense policies. As well as this, you can have adverts as sticky widgets which dramatically improve the performance of adverts (since the actively viewed time is far greater). You cannot do this with Adsense. But, since Ezoic are an Adsense partner, they get special exceptions for which they forward onto the users of Ezoic. And so the testing began! This is all automated: website owners do not have to do anything. The only thing that you will have to do is tell Ezoic how much traffic to show the new Ezoic advert layouts as opposed to the previous ‘three adverts Adsense’ layout, which, for me, was generating ~$1.22/1000 impressions. On the whole, this was kept to 75/25 in favour of Ezoic until Ezoic got a high enough accuracy to prove they were, in fact, making me more money than the previous Adsense layout was. When this happened, I gave Ezoic the full 100% of my traffic. 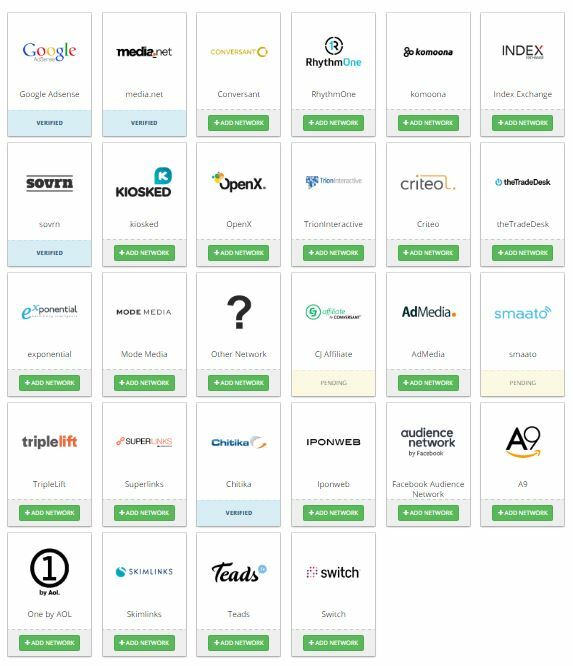 Ezoic also has a Mediation app, which allows you to incorporate many other types of advertising platforms, from the likes of Media.net to affiliate and native adverts outlined below. This enables different advertising companies to bid for your ad space, which will also improve the revenue you produce. Straight away, we can see that the EPMV value is actually much higher than the RPM value I was achieving in Adsense. But, the EPMV value is the revenue per 1000 visits and not impressions just like the case was when using Adsense. But, don’t worry! We can convert Adsense into revenue per 1000 visits by knowing the pages/visit the website was achieving. I know the first thing you will be thinking with this data is ‘how on earth did I, pretty much, double the pages/visit as quickly as that?’ Well, again like with much of this article, it is another question I will have to anwser as a separate article. But, what this data tells us is that when Adsense was being used, I was achieving a pages/visit of around 1.3. Therefore, that works out as that Adsense had a EPMV of $1.59/1000 visits. To be consistant, the changes I made to get a better pages/visit was irrelevant of using Ezoic. So, if I had of used Adsense when the pages/visit increased (to 2.5), I should have theoretically had an EPMV of $3.05/1000 visits. But, in practice, I didn’t. This was because I was still allowing 25% of the traffic to reach Adsense. From this, I was getting around £0.70/1000 views or $2.14/1000 visits. Even using this high overestimate of $3.05/1000 visits, Ezoic still performed better. For December, the increase in EPMV Ezoic brought was 86%. For January, the increase in EPMV Ezoic brought was 38%. 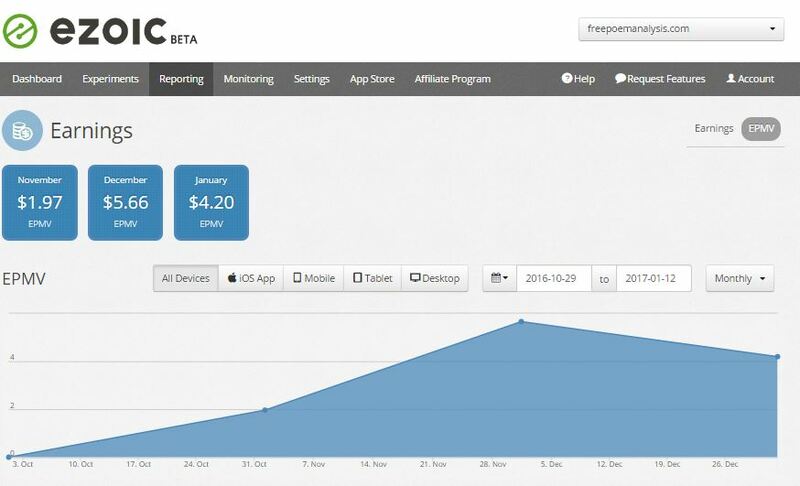 For December, Ezoic made me 160% more revenue. For January, Ezoic made me 96% more revenue. Although this is not as much as Ezoic claim (100-300%), it is still a significant increase to the earnings. The reason why it is a little less for January is because, after 30 days of free use, Ezoic takes the earnings of one of the less important adverts as ‘payment’ for their service. Even with this, the reveneue was still increasing by 38% or 96%, however you look at it. But, it is surprisingly not increased as much as Ezoic claim. If you look at the website now with the adverts, there are quite a lot of adverts on the website. But, it is always going to be a trade off between wanting more revenue to user experience, for which you can actually control inside Ezoic. Ultimately, I think every website should you Ezoic if they have the chance. Would most people take a 38% or a 96% increase in revenue fo having a few more adverts on a website? I think the answer would be yes and it is for me. The pages/visit has not decreased and still my traffic is still increasing alongside direct traffic, which states that people do not find the adverts annoying, especially with them being contextual. However, it is interesting to say the least that Adsense, with just three adverts, is not far off what Ezoic achieves with many more adverts and larger sizes (if you extrapolate it. If you use the actual value, then it is quite far off at 96-160%). Maybe this was because I had optimised the locations and the use of responsive adverts was great for desktops, tables and mobiles? I think, for a definitive answer, it is worth letting Ezoic run completely for the whole of February and then letting Adsense run for the whole of March (where hopefully pageviews and visits will be close enough to enable a comparison between the two). I hope this answers many of your questions surrounding Ezoic! Feel free to comment below and I’ll make sure I’ll anwser as many of your queries as possible surrounding the program. If you want to check out what the website looks like with Ezoic adverts, feel free to visit FreePoemAnalysis.com and browse through a few articles to get an idea of the advert layout Ezoic have chosen for the best peformance. If you are interested in signing up and giving Ezoic a go, you can do so by signing up here.